Historically, natural resources have been damaged by years of urbanization and industry, including soils, sediments and water. The Commencement Bay Natural Resource Trustees in adherence with state and federal laws, assessed the natural resource damage and assigned it to potential responsible parties (PRP). The City of Tacoma was among those PRPs and in 1997, the City entered into a Natural Resource Damage Assessment (NRDA) Consent Decree. The Consent Decree had many parts including: environmental protection efforts, tribal and oversight payments as well as the construction of five restoration sites. These sites were chosen based on their benefit to salmon and proximity to the natural resource damage among other criteria. The 1.85-acre piece of land next to Middle Waterway has been cleaned of its contaminated materials and reconstructed into an intertidal salt marsh. Volunteers planted native plants near the water to restore the habitat necessary for juvenile chinook, pink and chum salmon from the Puyallup River. Timeline: Construction complete 2000, planting complete 2001, monitored 2000-2005. Located on 12 acres of property bordering Swan Creek near Tacoma city limits and the Puyallup River, this project included enhancement of the existing Haire wetland. The connection between the wetland and Swan Creek was improved to allow salmon and other fish easier passage. Invasive plant species were removed and native plants were planted to restore the riparian areas around the creek and wetland. This 12.4-acre area includes land that the state Commissioner of Public Lands has withdrawn from leasing. To restore the area, 600 pilings were removed and 11 tons of contaminated sediment was replaced with 22 tons of clean sediment. The work returned the Olympic View upland and aquatic areas to its natural condition and preserved one of the last remaining eel grass beds in Commencement Bay. Nestled along the Ruston Way shoreline, a bowl-shaped salt marsh and upland areas were created in this area to restore riparian habitat. Contractors removed more than 6,000 cubic yards of soil. The clean soil was reused to create the upland areas and nearly 1,000 cubic yards of contaminated soil was properly disposed of off-site. Volunteers planted more than 6,000 native plants near the water. Located along Hylebos Creek at the foot of Northeast Tacoma, off-channel habitat was created and upland areas were preserved benefitting local Coho, Chinook, and Chum salmonid species. Amphibians and bird species will also benefit from the wetland enhancement. Under an agreement with the Port of Tacoma, they constructed the site and will monitor and maintain through the required time period. 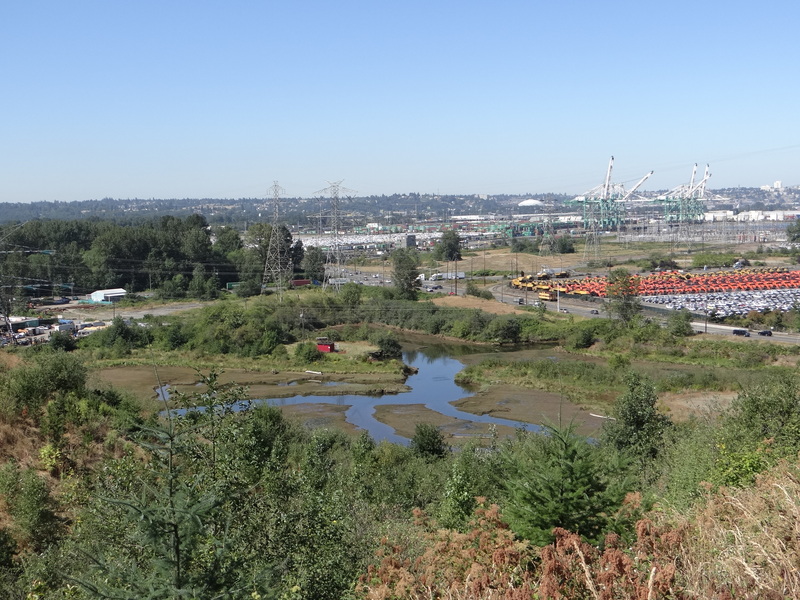 †Restoration work at the Middle Waterway and Tahoma Salt Marsh sites was funded by the City of Tacoma and the Commencement Bay Natural Resource Trustees: National Oceanic and Atmospheric Administration, U.S. Fish and Wildlife Service; Washington State Department of Ecology, Natural Resources and Fish and Wildlife; The Puyallup Tribe of Indians and Muckleshoot Indian Tribe.